Kearney NE – Mark Patrick Lose Weight Seminar With Hypnosis – Sunday, February 17th (JL) REGISTER NOW! For One Day Only, Mark Patrick Seminars Will Be Coming To Kearney NE. …That’s Right. Mark Patrick Seminars is coming to Kearney on Sunday, February 17th. Join the nearly 50,000 clients we see every year and attend this life changing program! …Because no matter how many diets you’ve tried or your past experiences trying to lose weight, THIS PROGRAM IS DESIGNED TO HELP YOU LOSE WEIGHT without hunger, without starvation dieting or your money back. All Seminars brought to you by Mark Patrick Seminars & Associates LLC, Mark may not be the presenter at your seminar. Testimonial results from programs are based on individual effort and other factors. Such results are exceptional or atypical and are not to be expected by the average person using these programs or methods. No one has been paid for their testimonial. By signing up for seminar you are agreeing to receive electronic communications from us. "I thoroughly enjoyed the program and instructor. I've lost 25lbs and kept it off"
"I lost 35lbs in 3 1/2 months"
"I lost 35lbs in 3 1/2 months. With the program I was able to eat better and starting walking more often. I felt a lot better with 35 lbs less to carry around. I also stopped smoking with Mark Patrick." - Kenneth Warner, Lawton PA.
"I dropped 12 pounds and 3 pant sizes"
"The hypnosis cured my late night eating. I thank you so much!!!" "I attended your seminar in Fairmont MN. So Far I have lost 41 lbs. and intend on keep going. My goal was to get around better so I could spend more time with my grandchildren and feel better. I do feel better! I am down 3 dress sizes. The hypnosis cured my late night eating. I thank you so much!!!" "I've lost 18 1/2 pounds"
"I've got this I don't need cigarettes!!!!" Tonight in Wellsville NY I got to meet Larry at the quit smoking seminar. He was amazing!!! By the time I left I smashed my cigarettes, cried like 5 times and didn't feel like I wanted a cigarette. I can't explain enough how much of a life changer tonight has been. I am not worried about tomorrow because mark Patrick quit smoking seminar taught me that I've got this I don't need cigarettes!!!! Well well well worth the money!!! "This program is fantastic. It is effortless." "It helped with my cravings"
"I would highly recommend this seminar for anyone who needs motivation"
"Lost 44lbs. The hypnosis worked for me"
"This program saved my life"
"Mark was fantastic! The information he provided was worth the cost of the seminar in itself. As a mortgage banker stress eating was a part of my evening but now it's not even a concern. I have lost 48 pounds in the 4 1/2 months since the last session. Today there are 18 of my family and friends here. They have seen my success and want to achieve the same results. My energy level is so much higher; I feel great and look better too!" 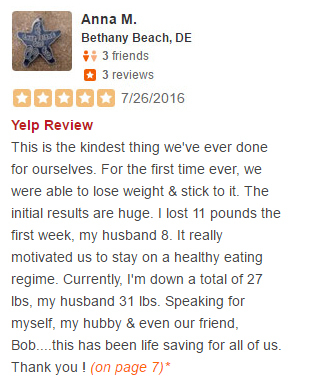 "I lost 36lbs and have recommended this program to several friends." "I am a 56yr. Old pharmacy technician. I am on my feet all day and found it very tiring to do my job. I tried every imaginable diet that came along with no success. I was ready to give up when I saw an ad to lose weight with hypnosis. I went. After the seminar I thought nothing was happening then a few days later I felt different- more alert and energetic. I found myself eating way less then I normally did and feeling full! I didn't have to think about what to eat...it just happened. I lost 36lbs and have recommended this program to several friends. Mark Patrick is great!" "I've lost 35lbs and have 0 cravings for any sweets"
"Lost 22 pounds. I'm thrilled with the program"
"I've lost 48lbs and feel great"
"Just over three months later I'm down 28 pounds." 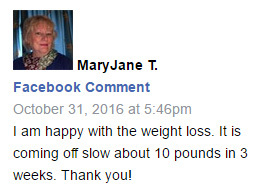 "In four weeks I had lost over 20 pounds"
In four weeks I had lost over 20 pounds. Less than four months later I have lost 50 pounds (55 pounds was my six-month goal at the seminar) and I feel great. 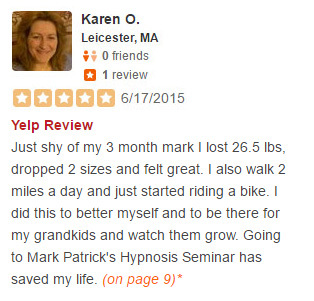 "Going to Mark Patrick's Hypnosis Seminar has saved my life." Going to Mark Patrick's Hypnosis Seminar has saved my life. Thank you to Mark Patrick's Hypnosis Seminars!!!! "I lost 90lbs in 4 1/2 months. My energy is higher than ever. I am now exercising on regular basis. Not to mention I have dramatically lowered my blood pressure. This program saved my life." "I lost 28 lbs in 6 months"
"I have lost about 22 lbs. in 6 weeks and close to 40 lbs total"
"I'm a hairdresser and I've tried every diet under the sun to try to loose weight and tone up. A couple of months ago I had a client come in that had been hypnotized for smoking, he was doing great, I asked if they did weight loss and he told me "yes". I saw an ad in our local paper about Mark Patrick Seminars so my daughter and I both attended. We were both a little skeptical, but we decided to try it. I felt different from that day on. I'm not sure how to explain it except when I look at something I used to eat and I know its not good for me it's like my mouth says "NO". I was hypnotized on February 12, 2007 and I have lost about 22 lbs. in 6 weeks and close to 40 lbs total." "I have lost over 60lbs"
"In June 2007 I went to a seminar in Pella Iowa. I followed your program and everyday I found myself wanting to exercise on my treadmill, I watched portion control. I drank tons of water. I also found myself sleeping better. I have lost over 60lbs. and would definitely recommend the program to everyone!" - Cathy D., Pella Iowa. "I would definitely recommend this program to others"
"I attended the seminar in Aug 2006. Mark was very thorough and covered the subject well. I am a housewife - have a house, outside dog, clean barn and throw bales of hay. It took 5 months to lose 23 lbs. I did not deprive myself of things that I wanted to eat, but ate less and enjoyed it more. I listen to my CD for about 3 months (that was my time). I would definitely recommend this program to others." - Judith Jones, Lewisburg WV. "I feel great and exercise more now"
"It was worthwhile and did very good things for me"
"I lost 40 pounds with 10 more to go!" My mom and I went to a seminar in February and again recently. Since the seminar in February I lost 40 pounds with 10 more to go! They gave me so much direction and motivation. I would recommend it to anybody trying to lose weight and to maintain a healthy lifestyle! "Seventy (70) pounds lost since Christmas!!"